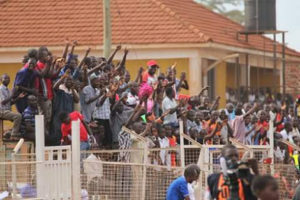 Teso willhave to replay it’s fixture with Bugisu. The Federation of Uganda Football Associations(FUFA) has made a ruling over the FUFA Drum tournament game between Teso and Bugisu that was abandoned on Sunday. The second of two games played in group A was called off with 15 minutes to play at the Katakwi Play Grounds. This was as a result of crowd trouble that resulted into Police firing tear has and bullets to disperse them. FUFA through the Competitions Disciplinary Panel headed by Deo Mutabazi on Monday issued a ruling basing on the match officials. The ruling States that the match will have to be replyed at a neutral ground. The FUFA Competitions Disciplinary Panel(CDP) has come to learn from match officials reports, the incidences that occurred in the above last group A match of the FUFA Interprovince/ The Drum Competitions played at Katakwi H/S Playground. a) The match was abandoned at 75th minute when the results were still zero-zero in favour of both teams as a result of rowdy fans entering the field of play. point which fans entered the field of play at the 75th minute”. b) The CDP further draws attention to the fact as reported that Bugisu bench sparked the fans interference after the referee seemed not to caution errant bench person yet to be identified, who threw a bottle on the pitch. ii. On a neutral ground to be determined by the Tournament Organizing Committee. iv. The Tournament Organizing Committee shall handle match organization. 2. Further investigations are being undertaken to identify the member of Bugisu Province team who threw a bottle on the field of play for appropriate disciplinary action. Busoga led group A on 13 points while Bugisu on 10 and Teso on eight points are still battling for the final slot to determine which team advances to the quarterfinals. The winner between the two sides will have to face Group D winners, West Nile. Bugisu, Acholi, Buganda, Kampala, Bukedi, West Nile and Ankole.